Piusa’s natural fossil is rare white sand which is perfect for a glass manufacture. In old times workers used to dig big tunnels to get the sand. 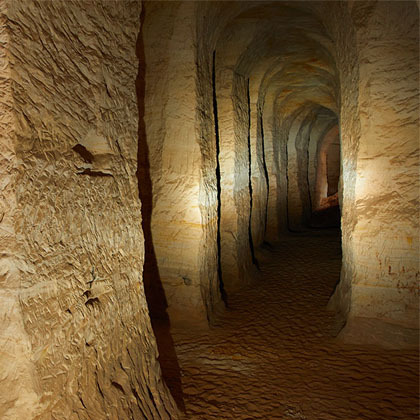 Those caves were dug in 1922-1966 and the total length of them is more than 10 km. Since 1966 the sand-pit is used to get the sand, so there won’t be more new caves. The existence of caves is in danger because the sand-pit is enlarged and the old caves collapse from time to time. From the middle of the 1990-s Piusa caves are known as the largest winter colony of bats in East-Europe. Tha main danger for bats are the people who visit the caves. The bats are very sensitive to any disturbing: even tha talking in the caves can disturb their sleeping and they are forced to find a new place to hibernate. 1. All of the Piusa caves are under protection of the state. It’s forbidden to damage them, pollute them, make loud noise or act in any other way which could damage the caves. It’s forbidden to make a tent, camp-fire and pollute in the caves or near them. 2. Being in the caves can be dangerous for your life because of the collapses and other dangers. 3. The bats who hibernate in the caves are under the protection of the state and disturbing of them is strictly prohibited. Touching of bats or approachin closer than 1 m is prohibited – it disturbs bats’ hibernating and is dangerous for people because of the diseases the byte of the bat can cause. 4. Only the “Museum-Cave” is meant for visiting (behind the Piusa store) – it’s less dangerous for people and the bats. At the hibernating period of bats (from september till april) it’s prohibited to talk loud in the caves or disturb the bats in any other ways. 5. The visiting of other caves is prohibited. Sandstone denudations. The highest of the sandstone walls is Suur-Härma wall (43 m), also known as Keldri wall. The view you can see from the river is like not from Estonia. It's the highest sandstone denudation in Estonia. The denudation is 150 metres long. The marked trail takes you to the forest-road taking a right turn. The heathy pine forest's relief here is from the times of ice age. Soon you'll see a sign that will show a way to Härma Lower wall. 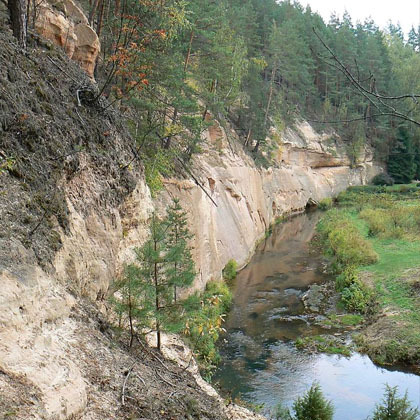 Härma Lower wall (20,5 m) is one of the most beautiful sandstone walls in Piusa valley. It's multicolor layers make a real nature sculpture. In the left part of the denudation you can find the old bunker of "forest brothers" (Estonian patriotic partisans in 1940-s). Here you can pitch a tent and make a camp-fire. 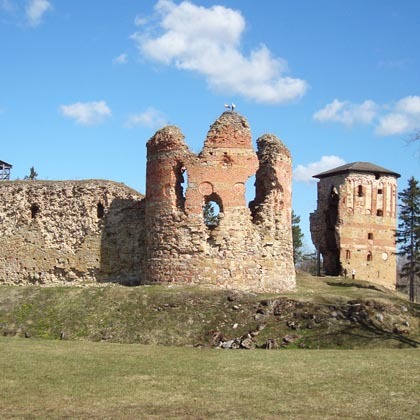 Vastseliina's castle was built by Tartu's bishop and Livimaa master of the order in 1342. Later it was rebuilt in the 15th century and the 17th century. The castle was unique in Estonia and Latvia. 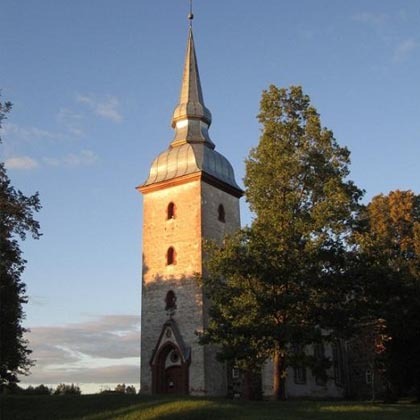 In the Middle Ages Vastseliina castle was famous for being the destination of pilgrimage of catholic people. The people came to see the sacred cross what was believed to make any miracles.In 1697 Peter the Great stayed in Vastseliina castle. The castle was strongly damaged during The Great Norther War and it was no more renovated. What can you find in Setomaa? The archeological discoveries tell us that people have been living here for a very long time - 5 000 years or maybe even 10 000 years ago. The local people managed to keep the old language, lifestyle, beautiful and unique folk clothes. 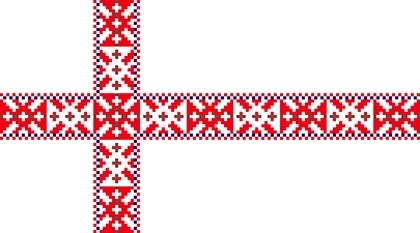 Setus (half-Russianized Estonians) have famous regilaul (folk poem in the form of the old Estonian folk song) where chanter can improvise and make a new song during singing. Setus' dance is unique, too. The handcraft of setus is colorful and their food is tasty. The real sight is setus' village in which the house are sited haphazardly, so you can't even see your neigbour's yard. Setus belong to orthodox religion. They have been living under the influences of two (west and east) cultures. Living in the skirt position let setus to keep Finno-Ugrian original lifestyle. Setomaa have been Nobody's Land for many centuries and the wars marched right through Setomaa from west to east and back for many times. Setomaa is now on the east border of Estonia and with the clear weather you can see Russia from Meremäe Hill. Setomaa is yet undiscoveried for many people and it offers many ways of spending your free time if you are interested to enjoy nature, setus' culture and to feel the touch of the centuries. In the 1990-s many old traditions were reborn. People started to look for their roots, to organise interesting events. Old traditions (eastern, christmas, setu's marriage), fairs and leelupeod (singing old Estonian folk songs expressed in runes) were back to stay. Leelopäevad is the traditional celebration which takes place in every 3 years and where leelu choirs come together to show what they can. Every summer Seto Kingdom is declared for a one day. They choose the vicegerent of Peko for one year. Then the people choose the best cooks, singers, dancers and craftsmen. "Piusa Ürgoru Matkarada", created by Võru County Environment Department.